The LITE-BL-FL and LITE-BL-FLB series LED flood lights are a fifth generation high output, high efficiency specialized commercial grade area flood light used in applications where day light is required including sports stadiums, factories, loading docks, building/bridge lighting, etc. 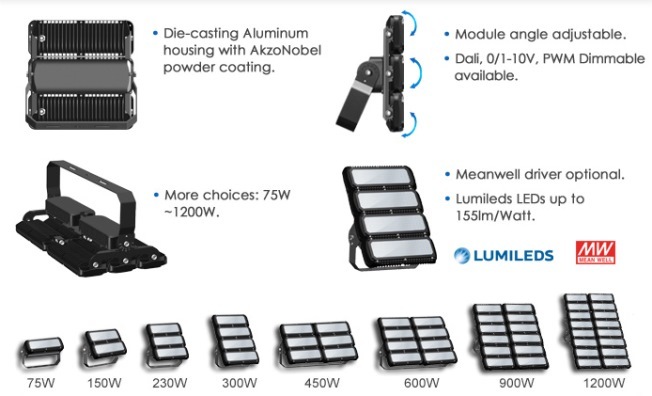 Available in 75W, 150W, 230W, 300W, 450W, 600W, 650W, 900W, 1200W or 1350W modules, and multiple beam angles including both symmetric 15°, 60° and 110° and asymmetric beam patterns of 130° x 40° and 130° x 25° there is enough flexibility to suite any application and tower height whilst achieving the most optimal and uniform lighting distribution. uctural requirements and to permit retrofits into applications where weight is critical such as mobile tower lighting. The Asymmetric beam patterns allow the projection of more light onto the sporting area or oval whilst reducing light scatter or light spill in surrounding areas, thereby increasing comfort for both residents and spectators. It often allows the use of a lower power flood light with more focused/asymmetric beam pattern in replacement of a higher power flood light with symmetrical beam pattern. See our lawn bowls case study for example. In this example of tennis court lighting, the asymmetric 130° x 40° beam pattern enables a highly uniform light distribution of 0.87 on the tennis court and maximum lighting levels whilst reducing the light to a minimum around the court and in the periphery. An optional diffuser or frosted lens can also be selected to further reduce potential glare. 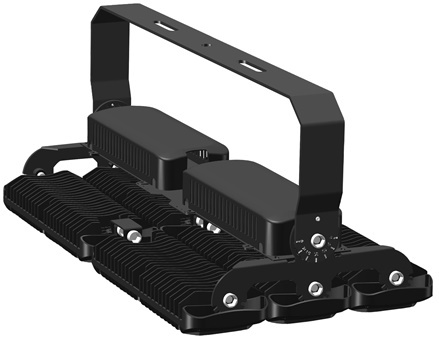 Due to the modular design of the LITE-BL series modular flood lights, multiple beam patterns can be incorporated in the single floor light unit to enable better projection across a field or oval where poles are positioned only on one side. Or each module can be angled to better project light into the designated area. At up to 1350W and up to 198,000 lumen (Nominal) the LITE-BL-FLB-1350W can meet the lighting requirements of a 2 x 2000W or 4000W or 5000W conventional metal halide flood light. The LITE-BL-FL-450W has sufficient capacity to meet the needs of a conventional 2000W metal halide flood light. The positioning of the LEDs allows almost 100% light projection towards your oval, carpark or warehouse, unlike the sideways mounted and omni-directional bulb of a metal halide which has much greater losses and relies on the quality and efficiency of the reflector. The higher efficiency of the LED projection system and high lumen maintenance (little light degradation < half that of a metal halide) allows up to 70% energy saving to be achieved. Whereas the metal halide will decay to approximately 50% to 60% of the original light output. The LED Flood Light will maintain over 80% of the original light after 40,000 hrs. The flood lights consist of an array of the latest generation Philips LUXEON 5050 LEDs with primary applications being downlights, high bay and low bay, and stadium flood lights. The Philips LUXEON 5050 with an output of up to 166 lm/W (5000K, CRI min 70) offers superior luminous flux at max current for reduced LED count. At a CRI of minimum 90 at an output of 134 lm/W at 5700K is still possible. The upgraded Luxeon 5050 that sets the standard for high lumen per watt (lm/W) for high bay and street lighting applications. With newly released LM-80 reliability data, the product also meets DLC Premium V4.1 requirements, enabling fixture manufacturers’ access to high utility rebates and energy savings. The Luxeon LEDs in the LITE-BR-FL2 series floods are driven by 1 to 4 separate Mean Well HLG-200H-36A LED Drivers to make up a maximum of 1000W output. Backed by an independent 7 year 60,000 hour warranty and established in 1982, Mean Well is a leading standard switching power supply manufacturer in the world. As shown in the image the Mean Well drivers are mounted independently from the LEDs with large air gaps and separate heat sinks to permit maximum cooling of both LEDs and power supply for increased life span. In the case of heavy industry and mining applications we can offer a high voltage version of the LITE-BR-FL2 LED Flood Lights such as 410V option using Meanwell HVG-200 Series LED Drivers. LED Professional. Components | LEDs | White LEDs | Jan 31, 2018. Lumileds Achieves Performance Breakthrough on Luxeon 5050. Click the button below to add the NEW Asymmetric Beam LED Sport Flood Lights - 75W - 1350W to your wish list.